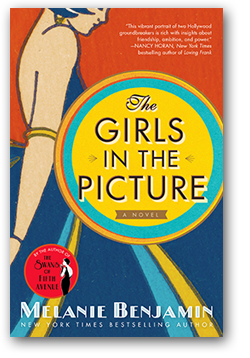 The questions and discussion topics that follow are intended to enhance your reading of Melanie Benjamin's The Girls in the Picture. Benjamin references many movies produced in the early days of Hollywood, such as The Birth of a Nation, The Poor Little Rich Girl, and The Big House. Have you seen or heard of any of these movies? If not, did the novel make you want to seek them out? Have you ever had a friendship as supportive, productive, and collaborative as Frances and Mary's? Do you think that kind of friendship can only thrive between the young and ambitious, or can you find it at any age? Are Frances and Mary truly equal creative partners or does one woman hold more power over the other? How do the power dynamics of their partnership change over the course of their lives? Consider the opening line of Mary's first chapter: "Mama, I made a friend!" How does Mary's relationship with her mother affect her throughout her career? Does Mary feel as though she needs to prove something to her—and if so, what? Seeing the frontlines of the war—and the war's brutal ramifications for women—is a turning point for Frances. Why do you think Frances makes the decision to leave her flourishing career and go to war? How did Mary's decision to stay in Hollywood and work on her movies affect her relationship with Frances? Mary Pickford and Douglas Fairbanks were the most celebrated couple of their age. Can you think of a similarly iconic couple alive today? Despite their remarkable success, Frances and Mary experience anxiety in their personal and professional lives. What is Frances most insecure about? What makes Mary feel imprisoned? What do you think causes Frances and Mary's friendship to fracture? Do you think it was one incident or many over time? Was it inevitable? Throughout the novel, Benjamin sprinkles appearances from well-known celebrities and illuminating details about the time and place of the story. What did you learn about early Hollywood and the naissance of the movie industry? What female screenwriters or directors do you know of? How do sexism, gender bias, and inequality manifest in the film industry today?